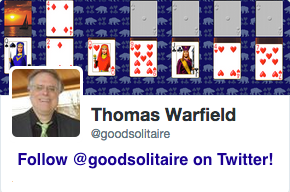 Screen shot of the game Fred's Three from Pretty Good Solitaire. 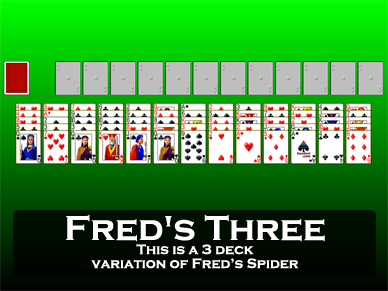 Fred's Three is a 3 deck version of the popular 2 deck game Fred's Spider. At the start of the game 5 cards each are dealt to 13 tableau piles. 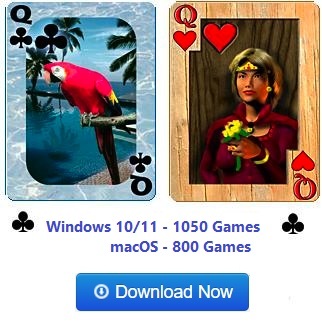 All of the cards are face up. The remainder of the cards form a stock. 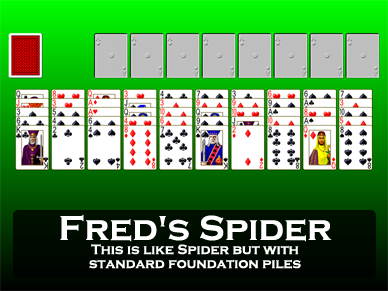 The object is to build 12 foundation piles (for the 3 decks) up in suit from Aces to Kings. Building in the tableau is down regardless of suit. 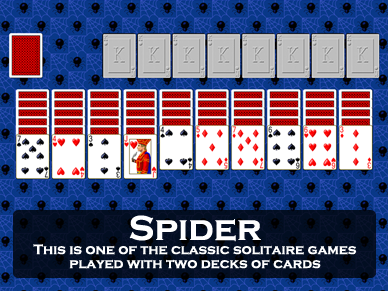 Groups of cards may be moved if they are in sequence down in suit (this is like Spider). Therefore building down in suit is to be preferred. Spaces may be filled by any card. When there are no plays in the tableau, clicking on the stock deals one card to each tableau pile.